Joel Embiid, who added 13 points, 11 rebounds and eight blocks for the Jayhawks on Saturday, celebrates after Kansas' last-minute win over Oklahoma State. LAWRENCE, Kan. — Bill Self was riding Naadir Tharpe so hard in practice earlier this season that the junior point guard began to wonder whether the Kansas coach even liked him anymore. Not just as a player — personally. Slowly but surely, though, Self began to build Tharpe back up. His confidence began to grow, and it showed on Saturday. He scored 21 points, including a key 3-pointer in the final minute, to help the No. 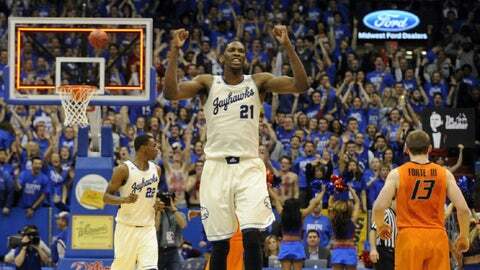 15 Jayhawks hold on for an 80-78 victory over No. 9 Oklahoma State. "Sometimes you scratch your head with some of the decisions he makes," Self said, "but he played extremely well, and of course he made some big shots." Joel Embiid added 13 points, 11 rebounds and eight blocks for the Jayhawks (13-4, 4-0 Big 12), who blew most of a 47-30 halftime lead before holding on at the finish. Phil Forte hit seven 3-pointers and had 21 points for Oklahoma State (15-3, 3-2). Marcus Smart added 16 points, but he was just 3 of 14 from the field and 0 for 6 from the 3-point arc. Still, it was Smart who nearly helped the Cowboys steal a win. His layup with 24 seconds remaining got them within 79-75, and after Frank Mason missed a free throw, Forte hit a 3-pointer to make it a one-point game with 5.7 seconds remaining. Mason was fouled and made the first of two free throws, and the Cowboys raced up court with the rebound on the miss. L’Bryan Nash tried to get off a shot from the arc as time expired, but Mason was there to pop the ball loose and preserve the victory. "We had the ball in our hands with a chance to win it," Oklahoma State coach Travis Ford said. "If he missed the free throw, I knew we’d get a shot off. We knew what to do." Markel Brown finished with 15 points for Oklahoma State, but he also earned two of the six technical fouls that were handed out. The second of them fouled him out. "We lost our cool a couple times in key moments of the game," Smart said. The animosity between the teams really started to simmer last season, when the Cowboys came into Allen Fieldhouse and ended the Jayhawks’ 33-game home win streak. Smart celebrated by doing a backflip, a stunt captured on film that Kansas coach Bill Self showed his team this week. It reached a rolling boil shortly before the season, when Smart declared that Kansas’ Andrew Wiggins had yet to warrant the considerable hype that the star freshman had been receiving. Naturally, most figured Smart and Wiggins would be the stars when their teams met. Instead, they were relegated to supporting roles — Wiggins scored just three points. Tarik Black took the spotlight first, fueling a 13-0 run for Kansas midway through the first half. The backup forward’s basket for a 29-15 lead left a sellout crowd that included Packers quarterback Aaron Rodgers roaring its approval. In fact, the noise was so deafening that Brown didn’t hear Ford call a timeout. He instead raced up court and found himself in the midst of the Kansas huddle, triggering a benches-clearing fracas that the officials had to separate. Brown and the Jayhawks’ Jamari Traylor were each hit with technical fouls. Things didn’t cool off, either. Later in the half, Smart was hammered by Wayne Selden on his way to the rim. Selden was shoved by the Cowboys’ Stevie Clark, drawing another technical. The Cowboys tried to mount a comeback on the second half. Forte got hot from behind the arc, and Brown hit four 3-pointers in the span of a few minutes to make it 59-56 with 11:02 left. Kansas stoically answered the challenge. Mason’s 3-pointer triggered seven straight points by the Jayhawks, and when Smart finally hit his first field goal with 5:53 left, Embiid answered with a thunderous jam. As the Jayhawks slowly rebuilt their lead, Oklahoma State began to lose its poise. Brown was whistled for a foul on Embiid, and voiced his frustration within earshot of official John Higgins, earning his second technical of the game and a seat on the bench. The Cowboys got within 77-73 on a basket by Smart with 1:29 left, but Tharpe answered again with a 3-pointer from the top of the key. The Jayhawks then held on in the closing seconds to put some distance on one of its biggest threats in the Big 12 race. "Definitely, I feel like we’re sending a message," Tharpe said. "Even though we have a lot of young guys on the team, we’re here to play. We’re here to defend our title. I feel like we have a great chance of doing it."